Tell Us: How’d we do? And what do you see coming? In January, the National Council of Nonprofits published 2015-2016: The Years in (P)Review, highlighting a dozen public policy challenges, opportunities, and emerging issues at the state and local levels that affect the work of charitable nonprofits. We’re starting the process of updating the report to provide insights and guidance for 2017. For that, we’re seeking your input: What do you see ahead that will be the big policy challenges and opportunities for the nonprofit sector in 2017? We rely on our networks of state associations of nonprofits, national nonprofit partners, and you, our readers, to know what is happening in the real world. Readers can help the entire nonprofit community prepare for public policy activities in 2017 by telling us what we got right, what was understated, and what we missed that you saw. Special bonus points go to those who identify emerging trends. Share your thoughts today. Congressional leaders continue to negotiate to reach a deal to fund the federal government into the new fiscal year that begins on October 1 and to adjourn quickly so incumbents can return home to their re-election campaigns. Early hopes of passing a short-term Continuing Resolution funding bill, known as a CR, confronted partisan reality last week as the deeply divided Congress struggled to resolve multiple issues. Many known interlocking pieces may move with a CR – including funding for both Zika virus research and the toxic water crisis in Flint, Michigan. Congressional leaders reportedly want the stopgap CR to run through December 9, but House conservatives have been pushing for a funding bill that runs into March 2017. The House is scheduled to be in town until the end of September, and the Senate through the first week of October, but both likely will adjourn as soon as they pass something to keep the federal government open past the November elections. A subcommittee of the House Ways and Means Committee held its first hearing last week to investigate higher education costs and the endowments of 501(c)(3) colleges and universities. Subcommittee Chairman Peter Roskam (R-IL) expressed concern about rising tuition costs and stressed that colleges and universities should be doing more with their endowments to offset these costs. One of the witnesses called for requiring higher education institutions to provide much more data on their Form 990 informational tax returns, including endowment investment returns and expenses, and the value of state-law property tax exemptions and payments made to local governments. He also recommended imposing a foundation-style excise tax on larger endowments and using the proceeds to subsidize community colleges. The hearing ended with promises of more hearings and potential legislation. IRS Commissioner Impeachment Effort: Proclaiming outrage at perceived inaction and hostility by the head of the Internal Revenue Service, conservative members in the House of Representatives are pushing to impeach Commissioner John Koskinen The dispute dates to the IRS scandal involving the perceived targeting of conservative social welfare nonprofits for extra scrutiny, a dispute that predated Koskinen’s leading the agency. Many conservative House members feel that he has stonewalled their investigations. On the other side of the issue, two officials at Public Citizen recently asserted in The Hill newspaper that the impeachment effort is a perfect example of a Congress that has chosen dysfunction over function, time-wasting over action and governance, especially where the IRS is concerned. New voting restrictions in at least 14 states, and confusion caused by media coverage of litigation in at least 10 states, could discourage voting by many individuals served by charitable nonprofits. In recent weeks, judges have prevented implementation of unconstitutional voting laws in Alabama, Georgia, Kansas, Michigan, North Carolina, North Dakota, Texas, Wisconsin, and elsewhere from taking effect. Many of the new voting laws were blocked in part because of the motivation behind them: racial discrimination to gain a partisan advantage. A three-judge panel unanimously prevented enforcement of North Carolina's new law "that restricted voting and registration in five different ways," deliberately "target[ing] African Americans with almost surgical precision" in an effort to suppress black turnout at the polls. A federal judge found that new voting laws in North Dakota impose "a disproportionately negative impact on Native American voting-eligible citizens." The Fifth Circuit Court of Appeals agreed with a trial judge's findings that a Texas voter-ID law "burdens Texans living in poverty" and had a discriminatory effect against African-American and Hispanic voters. The court actions preserve voting rights, but there is concern that the uncertainty caused by the on-again, off-again restrictions will have the effect of discouraging the targeted voters – people of color and low-income individuals – from exercising their constitutional rights. Community leaders have a unique opportunity to help ensure that everyone who wants to vote gets to vote. 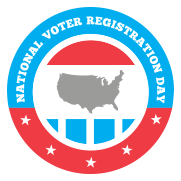 An immediate nonpartisan step that all can take to help counter the confusion about current election laws is to sign up today to participate in National Voter Registration Day that takes place on September 27. This single day of coordinated field, technology, and media efforts is designed to create pervasive awareness of voter registration opportunities – allowing volunteers to reach tens of thousands of voters who are otherwise out of reach. Read "In a Year of Intimidating Voters, It's Never Been More Urgent for Nonprofits to Get Out the Vote," an op-ed in the Chronicle of Philanthropy by Tim Delaney, President and CEO of the National Council of Nonprofits, for more information about these current voting rights challenges and the importance of the 2016 elections to the work of foundations and nonprofits. ​The main policy action affecting the work of nonprofits and foundations will continue to be at the state and local levels after the upcoming elections, as it has been for years. On November 8 voters across the country get to decide who fills 5,920 state legislative seats along with 93 statewide offices such as governor (12 to be elected), attorney general (10), and secretary of state (eight). There are also thousands of local city, county, judicial, school district, and special district officials up for election in November. 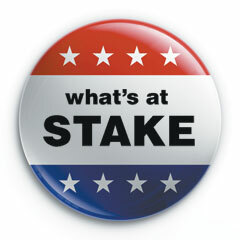 Further, voters will be deciding the fate of 153 statewide ballot measures and hundreds of local ballot questions across the country. Each race and ballot measure has the potential to positively or adversely affect the ability of nonprofits and foundations to advance their missions. The Urban Institute and Columbia Law School just released a report, State Regulation and Enforcement in the Charitable Sector, based on data collected in 2013 and 2014 from 47 of the 56 state and territory jurisdictions with “oversight, regulatory, and enforcement authority over charities.” The research focused on the structure of state charity offices, oversight authority and types of charities overseen and monitored, and tools used to enforce compliance. Among the findings: “oversight involves a complex mix of substantive areas, including charitable trust law, governance, criminal law, solicitation and registration requirements, corporate transaction review, and conservation easements.” Also, “in 59 percent of the states, [regulatory] responsibility is shared with [multiple] agencies or offices,” with the three most common areas of enforcement being fundraising (62%), trust enforcement (36%), and governance (36%). The most frequent partner with whom the regulators reported working to promote education and outreach to nonprofits were state nonprofit associations. Aspects of managing government grants and contracts rank as the top three concerns of nonprofit finance professionals, according to results of a new survey released by Abila. The top concern identified by a survey of over 400 nonprofit finance professionals was the complexity of managing multiple revenue sources, each with different requirements. Next, the survey participants expressed concern about how new rules and regulations affect an organization’s costs. Even when changes are positive, such as with the OMB Uniform Guidance, the report shows that there is almost always a cost associated with implementation – costs that often are indirect and under-reimbursed. Finally, the third most common challenge identified was the added time and new costs required to comply with new rules and regulations, with two-thirds of the nonprofits indicating that not only has the amount of time spent on compliance increased in the last two to three years, but also the costs associated with compliance has increased — which further adds to a nonprofit’s indirect costs. The Office of the North Carolina Auditor released a report of “pervasive findings” from its audits of state government agencies. The audit found that state agencies’ contracting processes generally need to be improved, noting deficiencies in the bidding process, contract negotiation, and contracting administration and monitoring. Further, the report concluded that many state agencies don’t have processes in place to ensure that federal and state grants are spent for the purposes for which they are intended. Earlier this year, the North Carolina House unanimously approved a study committee that would have made recommendations to address the very deficiencies uncovered by the Auditor’s Office, including reducing late payments to nonprofits, unnecessary red tape, and state agencies underpaying nonprofits for the indirect costs they incurred for the state. The Senate did not take up the legislation prior to adjournment. While most of the election-related media coverage is focused on the presidential election, nonprofits across the country are taking nonpartisan steps to engage candidates at the state and local levels, and ensuring that individual nonprofits are doing their part to open dialogues before officials are elected in November. First, they urge nonprofits to “check out the responses from candidates listed on your ballot.” The North Carolina Center rightly points out that the responses show how each candidate’s public service has been shaped by her or his experience with nonprofits and that all care deeply about having a vibrant nonprofit sector in the state. A word of advice given to the nonprofits in North Carolina is worth heeding by all nonprofits: “Please remember that while your organization can (and should) share this information, it is illegal for 501(c)(3) nonprofits to endorse or oppose candidates for office.” The rules for engaging with candidates in a nonpartisan way are relatively straightforward and need to be followed. Nonprofit VOTE provides more information about Candidate Questionnaires and Voter Guides. National Voter Registration Day will take place on Tuesday, September 27, 2016. This is a single day of coordinated, nonpartisan activities aimed at registering as many eligible Americans as possible. It is a great opportunity for nonprofits to help ensure that their staff, board, volunteers, and the people they serve are registered to vote. Sign up today to participate as a nonprofit partner on this special day. - Traci Donnelly, executive director of The Child Center of NY, writing in Government shortchanges nonprofits, quashing innovation, Crain’s New York Business, September 7, 2016, demonstrating the harm to nonprofit effectiveness when governments and funders impose arbitrary caps on reimbursement for indirect costs. - Elspeth Revere, writing in “Foundations are Losing Sight of Nonprofit Struggles,” Chronicle of Philanthropy, September 6, 2016, expressing concern for funding trends that provide fewer general operating support, program grants that fail to adequately fund indirect costs, short-term grants, and an over-emphasis on measurable results at the expense of effective, but hard-to-measure programs. Restoring More Discretion to the Federal Budget, Gene Steuerle and Rudolph G. Penner, The Government We Deserve blog, September 15, 2016, analyzing the federal budget system that has produced “a predetermined, inflexible federal budget that does not reflect our country’s needs,” and calling for review of entitlement programs, tax revenues, as well as longer term budget projections – all to create a more sustainable process. 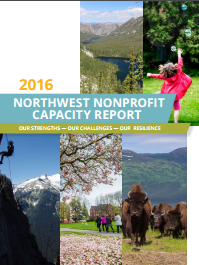 ​2016 Northwest Nonprofit Capacity Report: Our Strengths - Our Challenges - Our Resilience, based on survey data from over 1,000 nonprofits in Alaska, Idaho, Montana, Oregon, and Washington. The report highlights the progress nonprofits are making in creating a resilient sector, specifically focusing on four core areas for building capacity: mission effectiveness, collaboration, public policy, and use of data and evaluation. According to the report, all stakeholders - including nonprofit organizations, funders, and government - share the responsibility to support and enhance the performance of the sector. The report calls on funders to provide more unrestricted financial support to strengthen the critical infrastructure of nonprofits and urges government to seek more participation by nonprofits in setting public policy. The number of people who rose out of poverty from 2014 to 2015, the greatest change in the poverty rate (down 1.2 percent) since 1968. During the same period, real median household income increased 5.2 percent, the first annual increase since 2007. Source: Income and Poverty in the United states: 2015, U.S. Census Bureau Current Population report, September 2016. See also, US Census Bureau Annual Report Shows 3.5 Million People Lifted out of Poverty, Jim Schaffer, Nonprofit Quarterly, September 15, 2016.